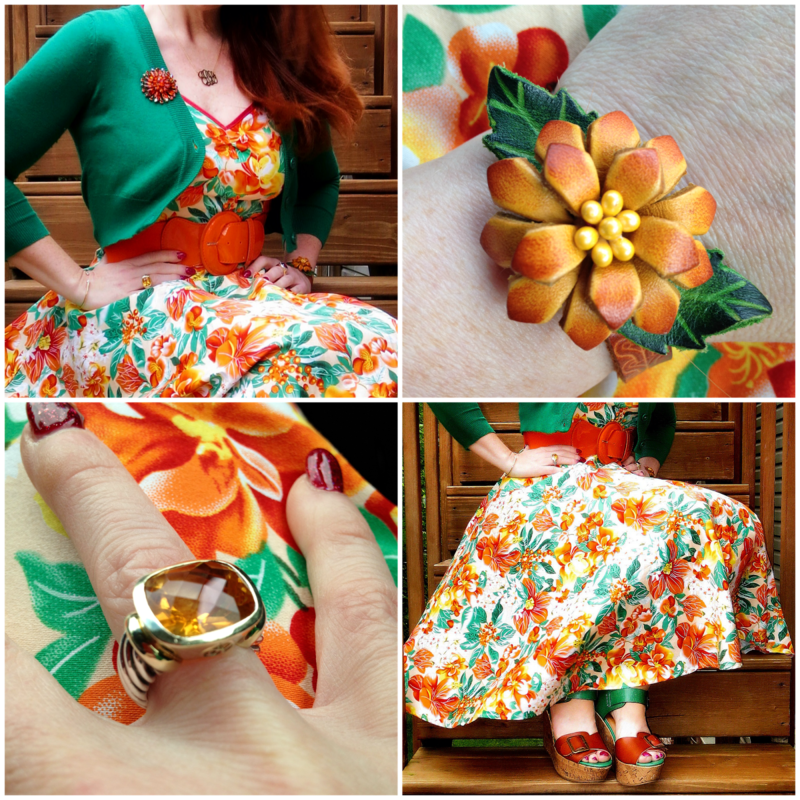 So the bright tropical print on this dress is pretty loud, even for me. And yet, I love it. 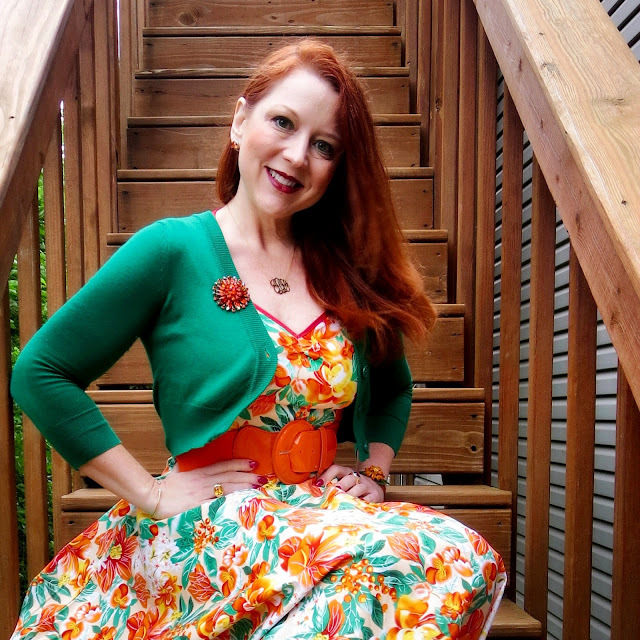 I love it because it's just a happy looking dress; I love it because orange and green are my favorite colors; and I love it because wearing it reminds me of dancing with my Mom when I was a little girl (well, my Mom danced and I tried my uncoordinated best to follow along). For many years when I was little, my Mom and a few of her closest friends practiced belly dancing, as well as the hula. 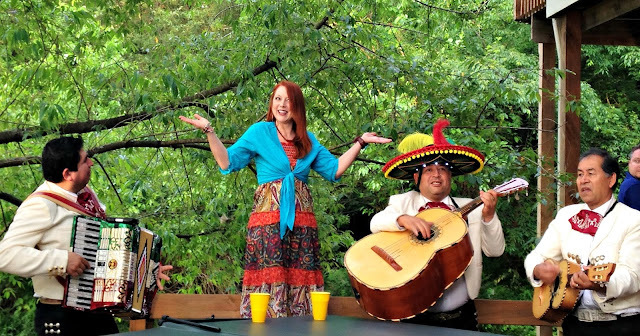 They even performed in local shows. I don't remember how or why they started dancing (I need to ask her!) but I do have vivid memories of watching Mom, Carol, Jocelyn, and Linda practice various routines in one another's living rooms. Not surprisingly, I also remember the costumes well. Mom sewed most of her own costumes (one of which I even wore parts of as a Halloween costume in the 5th grade and again as a college sophomore). 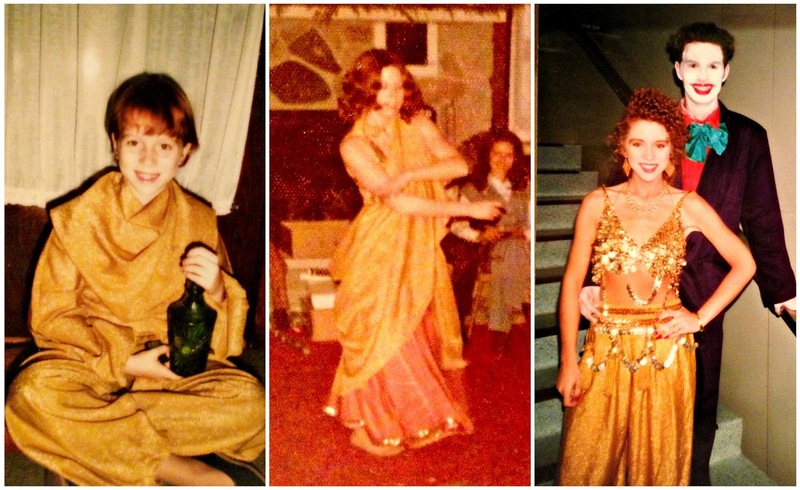 Left to right: Channeling I Dream of Jeannie in Mom's gold lame for a 5th grade Halloween party; Mom performing in parts of the same costume; Sporting the same pants and more pieces of the costume for a Halloween party during my sophomore year in College . Who knew that belly dancing gear was so versatile...?! Oh, yes, how I loved to play play dress up in all those layers of organza, lame, and sparkles. Too bad I never asked her to teach me to sew for myself because it's a skill I really, really wish I had now. But I digress.... This dress, which I bought for a song through Amazon, reminds me of a very specific routine she and her friends performed in a Tri Kappa Follies show. It was a traditional Hawaiian hula dance, performed to The Hukilau Song. 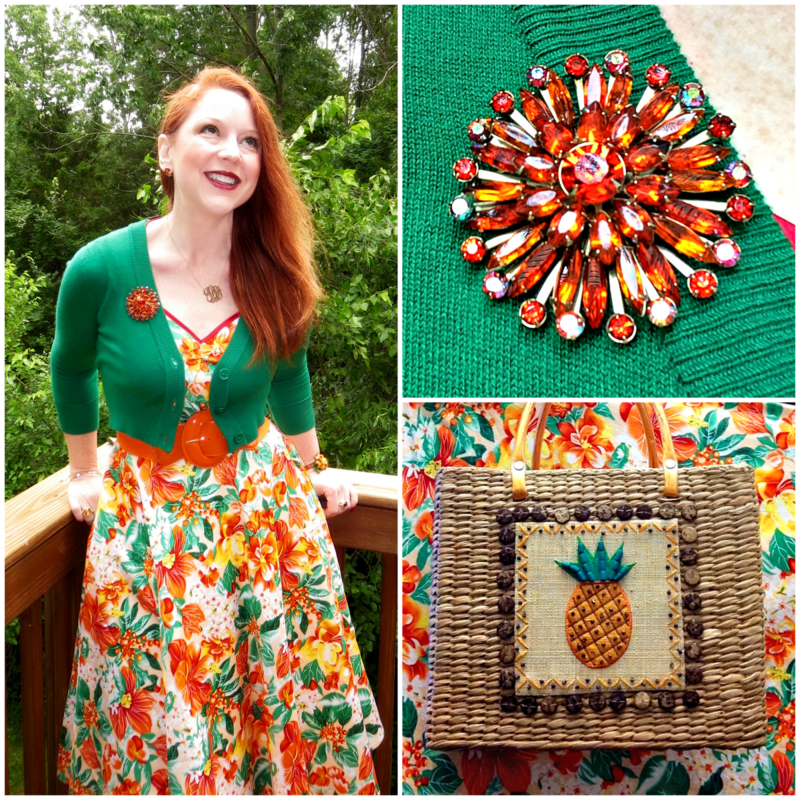 With its vibrant tropical print, that song and those costumes were the first thing that came to mind when I wore the dress for the first time a few weeks ago for a Reel Big Fish concert. I spent what seemed liked hours standing behind Mom and her friends in Carol's living room, trying to mimic all the steps as the song played over and over again while they perfected the routine. 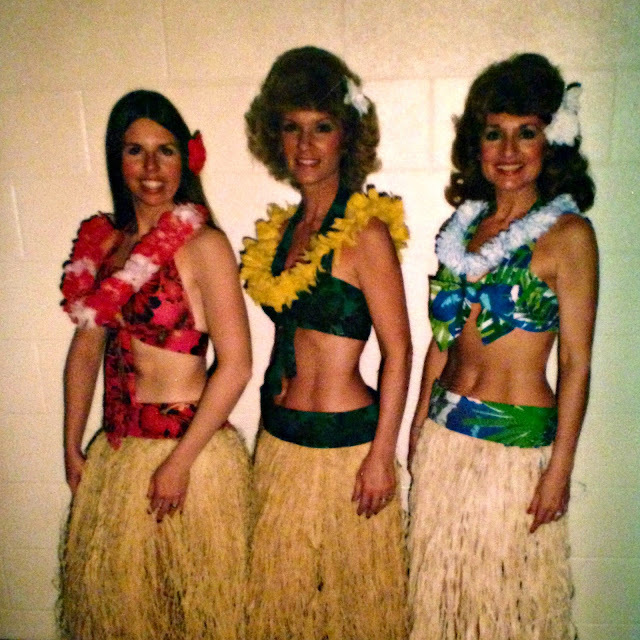 Mom with her friends Joceyln and Carol backstage before their Hukilau performance at the Tri Kappa Follies in the 1970s. Mom - not sure if you knew I had this photo (don't shoot me for sharing)! I remembered the song's melody and first few lines well, but I actually had no idea what a hukilau was. According to Wikipedia (so it must be true, right? ), a hukilau is a traditional Hawaiian method of fishing in which a group of people work together to cast a large net lined with leaves from the shore. When I looked up the song's lyrics, I found that, sure enough, the song is about fishing in "that old Hawaiian way." Just perfect for a concert by a band that goes by the name Reel Big Fish (whose lead singer was also sporting a tropical print)!